We are HahoninArt, a family of lifelong artists and designers based in Ljubljana, Slovenia. We launched this Webshop so that we could open up our life’s work of unique original canvas paintings and prints to art lovers across the entire world – not just confined to a single art gallery. 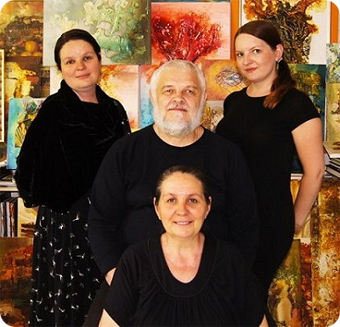 All of our works are Originals, created individually by either husband and wife, Sergej and Ljuba, or daughters Nastasija and Ksenija. Please browse our portfolio, and feel free to get in touch. Sergej Hahonin was born in Chernogorsk, USSR. In 1977 he graduated with honors from Art Gymnasium V.I. Surikova, Krasnoyarsk. In 1984 he graduated from the Siberian Academy of Fine Arts in Krasnoyarsk (ceramics and pottery), where his final project was made of porcelain with the theme on ‘Wind, Rocks, The Sea’. 1985-1991 he was employed in Krasnoyarsk state-owned company to create folk art as a painter and as a head of the Association of Contemporary Art. On the basis of numerous exhibitions he became a member of the Association of Painters and Sculptors of Soviet Union. Ever since 1979, she has actively participated in art exhibitions in local, country and international level. Since 1993 he lives and works in Ljubljana, Slovenia, making unique ceramic and paintings, closely interwoven with the Slovenian culture and traditions. His works have been exhibited in museums and collections in Russia, Germany, Australia, Portugal, Slovenia and the United States. Ljuba Hahonina was born in Abakan, USSR. In 1977 she completed Art Gymnasium V.I. Surikova in Krasnoyarsk, course design. Between 1982 and 1984 she studied at the University of M.A. Gorkega, Omsk. In 1985 she continued her studies at the Art Academy in the Siberian Krasnoyarsk. 1985-1991 she was employed in Krasnoyarsk state-owned company to create folk art and as a leader of the Association of Krasnoyarsk art discipline and folk art. On the basis of numerous exhibitions she became a member of the Association of Painters and Sculptors of Soviet Union. Ever since 1979, she has actively participated in art exhibitions in local, country and international level. Since 1993 she lives and works in Ljubljana, Slovenia, making unique ceramic and paintings, closely interwoven with the Slovenian culture and traditions. In 1995 she became a member of the Association of ceramist and potters of Slovenia. Her works have been exhibited in museums and collections in Russia, Germany, Australia, Hungary, Slovenia and the United States. Nastasija Hahonina was born in Krasnoyarsk, USSR and moved with her parents to Ljubljana, Slovenia when she was 5 years old. After spending her childhood pursuing her music and art career, she moved to London, UK, in 2007. Working as a visual merchandiser, she discover her love for interiors and continued her studies at Kensington & Chelsea College, graduating in Art and Design – Interior Design. Her first solo artwork was exhibited in 2011 at the XLVI, International Painters ex-tempore in Portoroz, Slovenia, where her design of tea bags on canvas was selected as one of the best 50 out of 500 artworks. After spending a year in Toronto working on the HahoninArt website, she is currently back in London pursuing her passion for art and photography. You can find her personal photography blog over at nastasija.photography. Ksenija Hahonina was born in Malinovka, USSR and moved to Slovenia in 1993. Her first work was exhibited in 1994 in Studio VIVO, part of celebrating 850-year of city Ljubljana. In 1995 and 1996 she attended the 1st and 2nd Ceramic and Pottery Fair in Ljubljana. In 1996 she attended Pottery Fair in Paderborn, Germany. In 1997 she won a prize for a participant below the age of thirty on Zagreb’s Triennial Exhibition Of Small Ceramics. She participated in International Ceramics Fair in Klagenfurt, Austria in 2002 and a Croatian exhibition ‘Vases For Flowers’. In 2003 she finished her Master Degree in Journalism from Faculty Of Social Science, University of Ljubljana. In 2005 the Journalists’ Association of Slovenia awarded her Consortium Veritatis Journalist Award for working in Mladina in 2005. Since 2006 she works and lives in London, UK.